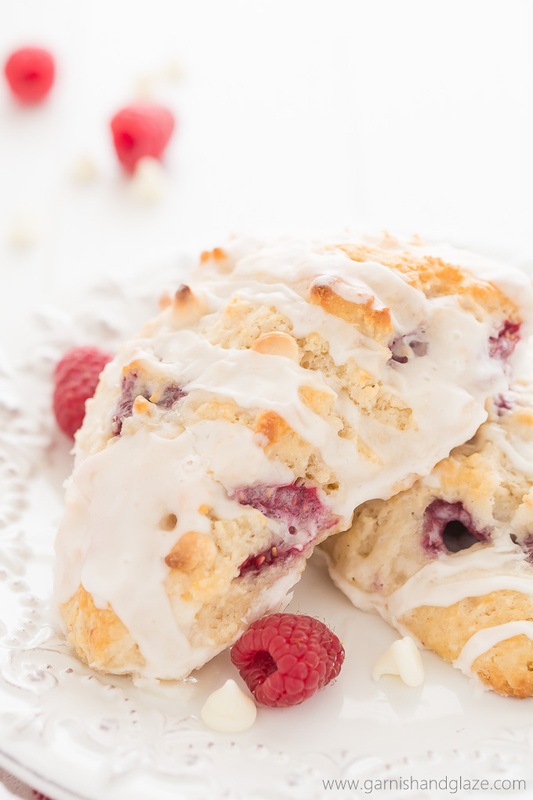 Serve White Chocolate Raspberry Scones at your next Sunday brunch for a super light and tender scone that no one will be able to stop talking about. Oh, my! These scones are seriously amazing!!! It’s more like a dessert but the breakfast and dessert line is kinda blurred with a many “breakfast” foods. 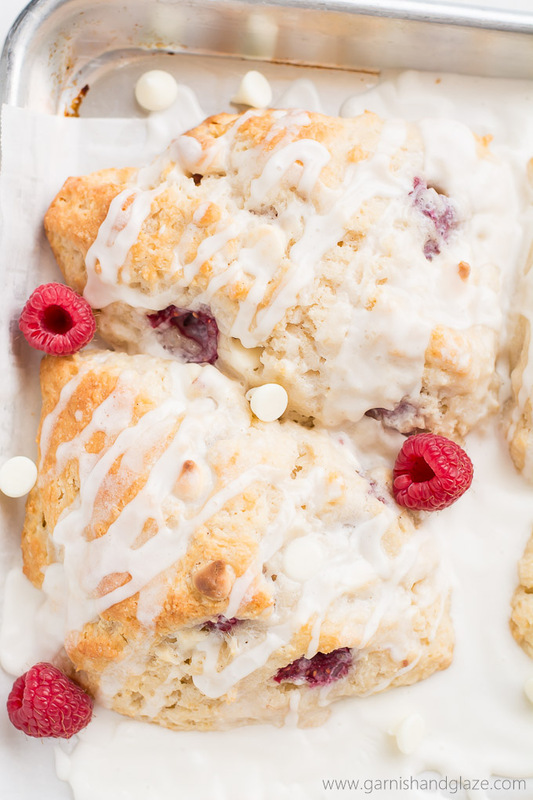 Lots of butter and filled/covered with sugar describes cake, brownies, cookies as well as waffles, cinnamon rolls, donuts, and scones… like these gorgeous White Chocolate Raspberry Scones. Do you remember my Blueberry Scones? Well, these beauties are made with the same flaky, tender dough but filled with raspberries and white chocolate chips and then drizzled with a vanilla glaze. 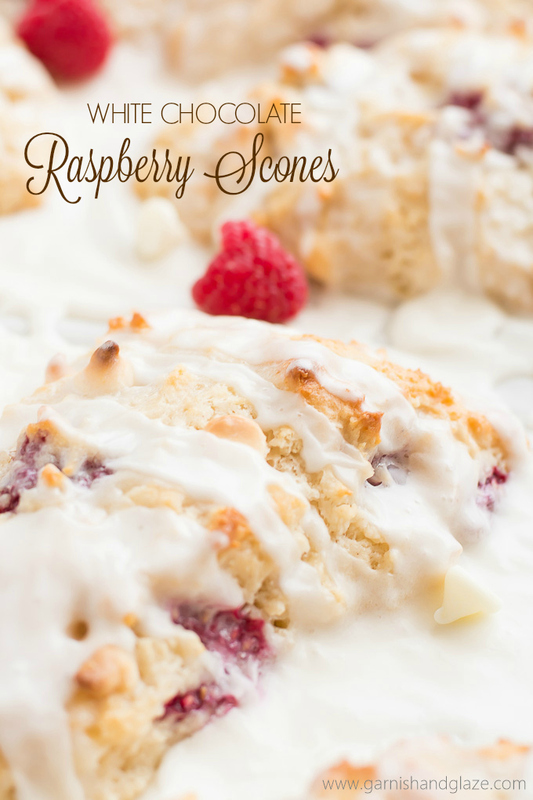 Both scones are amazing but raspberries have my heart so if you can’t decided which to make, I suggest these babies… or you could throw both berries in! If you’ve never made scones before, don’t be intimated! They are super easy and come together quickly. Plus, they are supposed to look rustic and lumpy so you don’t have to worry about it looking perfect. 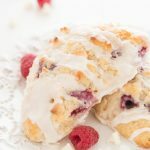 The raspberry and white chocolate combo in these scones reminds me of my wedding cake… which my husband and I enjoyed 6 years +1 day ago. Time sure flies! We’ve been through 4 moves, 2 states, 2 kids,… and a bunch of other randomness. It’s so much fun to experience everything in life, the good and the bad, with Nick at my side. He is such a loving husband and amazing father. So grateful he chose me! It’s been way too long since we’ve had a date and time alone without the kids (thank you medical school debt, long hours, and endless studying!) but my awesome friend was willing to take our girls off our hands for a few hours. We went out earlier in the week and enjoyed some fantastic sushi (though I refused to eat the ones with raw fish) and then became kids again and went to Dave and Busters to play Arcade games. It was so fun and felt like it was when we were back in college just dating. Speaking of being kids again, today my husband and I (plus the kiddos) are going to Worlds of Fun! I haven’t been since my middle school band trip 10+ years ago so I’m super excited! I probably won’t be able to stomach the Mamba so I’ll just stick to the kiddie rides with my daughter and then enjoy the scrumptious food at the All American BBQ & Brewfest. 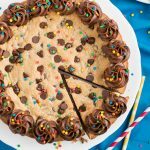 Follow me on Instagram to see all the fun festivities! 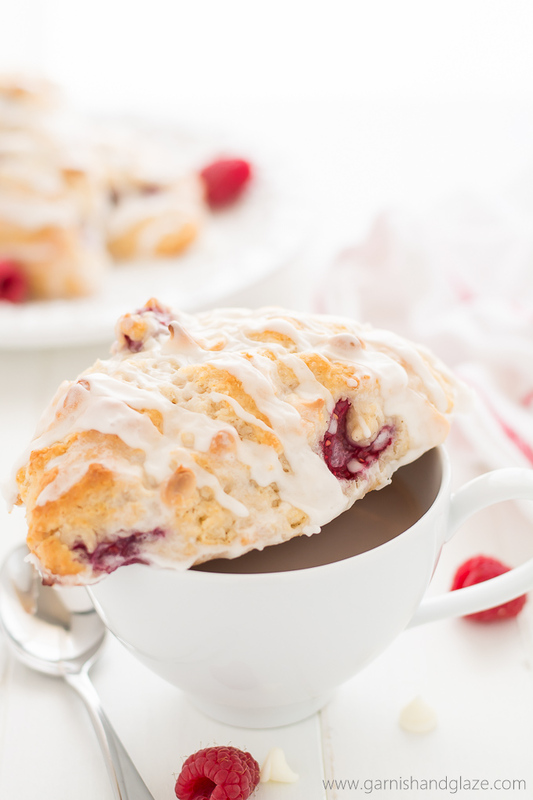 …and then go make yourself some White Chocolate Raspberry Scones. Mix milk and sour cream together in a small bowl and place in the fridge. In a medium bowl, mix together flour, ½ cup sugar, baking powder, baking soda, and salt. Add the grated butter and mix in with a pastry cutter or two forks until the size of small peas. Drizzle the milk mixture in and fold in until combined. Sprinkle dough with the raspberries and white chocolate chips. Roll dough up into a long log and then slightly press it down so that the top isn't so rounded. (Press extra raspberries and white chocolate into the top of the dough if desired.) Cut dough into four equal squares and then cut each square diagonally to make a total of 8 triangles. Place wedges of dough on prepared baking sheet, spacing them 2 inches apart. Brush the tops of dough with the melted butter. Bake for 18-22 minutes until tops are lightly golden. Allow to cool for a few minutes and then add the glaze. Serve warm or at room temperature. Store uncovered at room temperature. Best if consumed within 2 days. Whisk glaze ingredients together and drizzle on top of scones. What a perfect way to start out a Sunday morning! 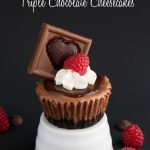 My sister would LOVE these so the next time we get together I think I might surprise her and bake up a batch to share with her!! Thanks Holly! 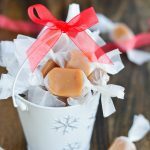 If you aren’t already her favorite sister, you will be after you make her these! Ha! 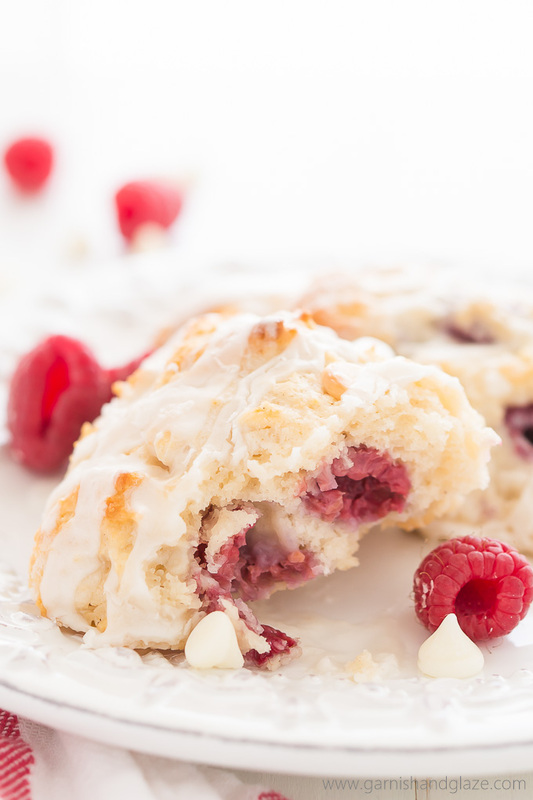 I’ve really been craving the Pillsbury White Chocolate Raspberry Scones.. but they only sell them for food-service. As much as I’d love to eat a whole 96 ct. case of scones.. I don’t think that’d be a good idea. haha I found your recipe, and it looks wonderful! Can I dice up the raspberries so there isn’t such big chunks? Also, can I mix the white chocolate and raspberries into the flour mix, then pour in the milk mixture? It seems like that would make it a little simpler.. I’m not much of a from scratch baker. Then I could form the dough into circles and cut like a pizza! I haven’t tried that method but I think it would work just fine. Let me know how it goes. 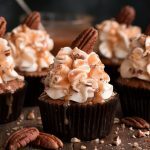 These were amazing and so easy to make. I will definitely be making them again.